Another weekend flew by too fast, but it was a great week and weekend with lots of good eats for the Sacramento Vegan Chef Challenge. At Grocery Outlet, hubby found these little single serve containers of Go Veggie Vegan Chive & Garlic Cream Cheese he had to try for a baked potato. 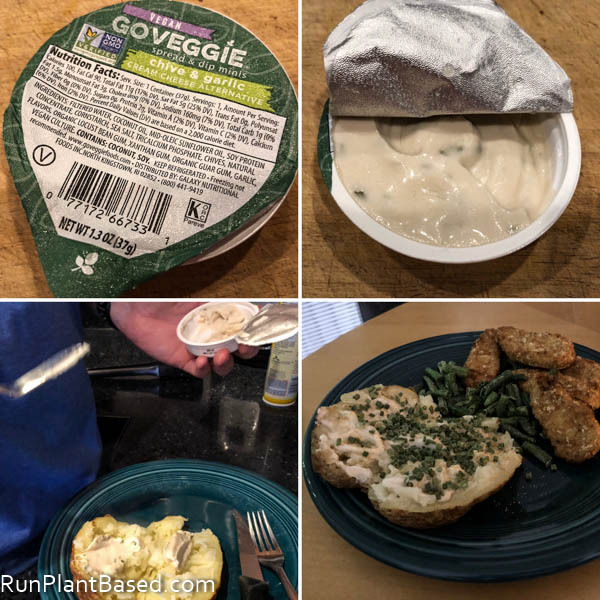 He is a fan of loaded baked potatoes and gave this a thumbs up as an alternative to vegan cheese with a tangy and savory flavor. 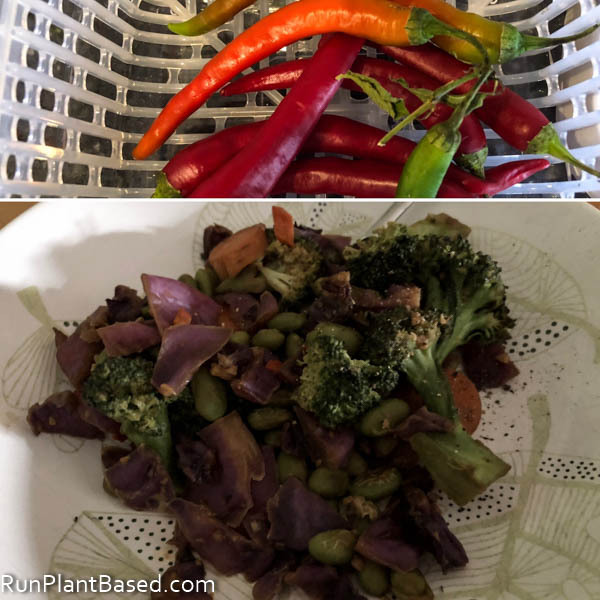 I scored some pretty hot Thai peppers from a co-workers garden and chopped one up to add a little heat to an oil-free edamame stir fry. Whew, they packed a nice level of heat, in a good way still preserving the flavor and not over powering. And something I will be doing again to add colorful flare to tofu stir fries in the future. 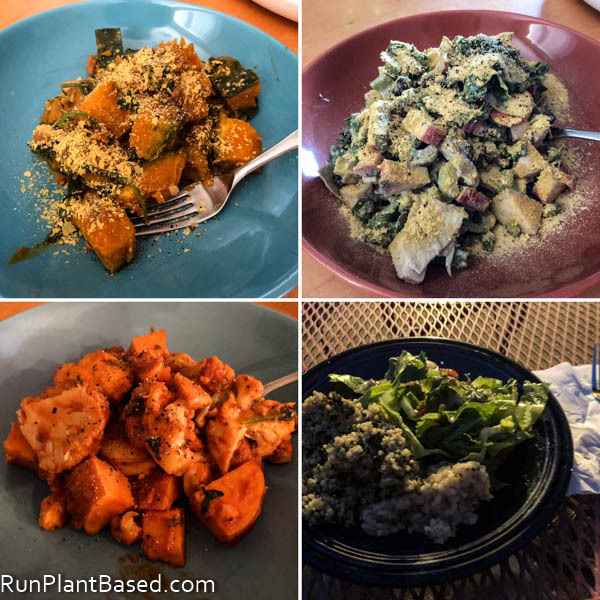 Other eats this week included a simple curry kabocha squash saute, loaded kale salad with beans and a kicky hemp seed dressing. Chopped sweet potato, cauliflower, and butter beans simmered in marinara sauce and vegan risotto, salad, and a kicky dill Dijon spinach quinoa dish I did for a family casual gathering. I free-handed the quinoa recipe, but need to write it down because it was delicious with a Dijon dilly flare and savory depth. 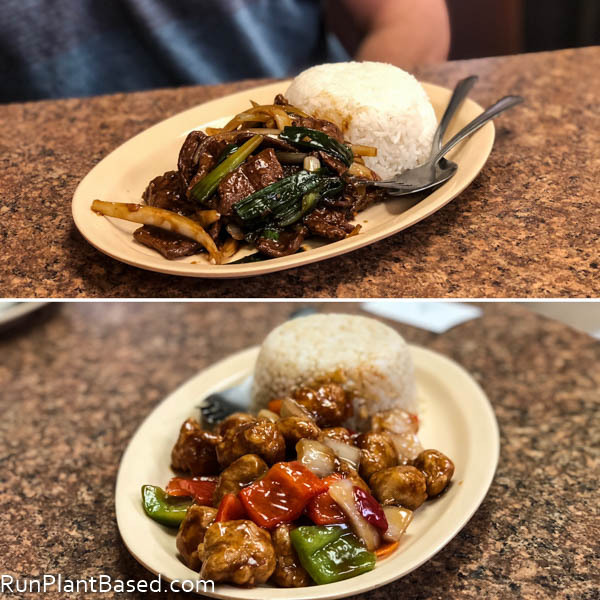 We’ve also been eating out a lot trying to support and try options from the Sacramento Vegan Chef Challenge going on all this month including the mock beef and vegan orange chicken dishes from Pho Vegan Asian Cuisine. 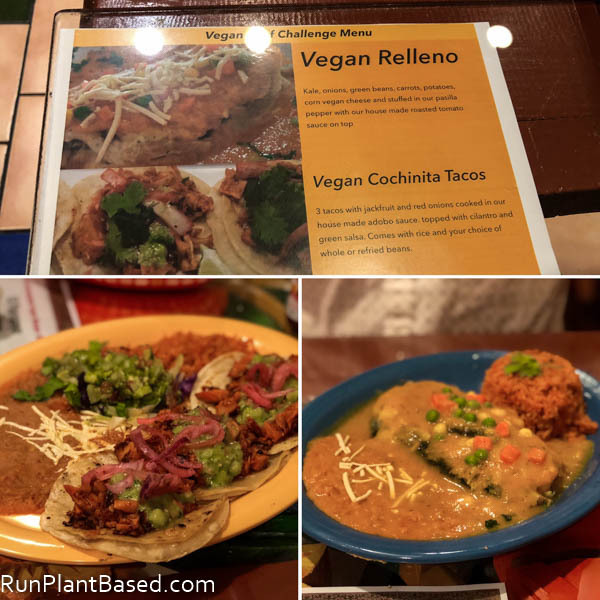 And we tried new offerings from El Papagayo Mexican Restaurant on Friday where the Vegan Relleno was great, but the Vegan Cochinita Tacos really shined with tangy, marinated jackfruit loaded with flavor. 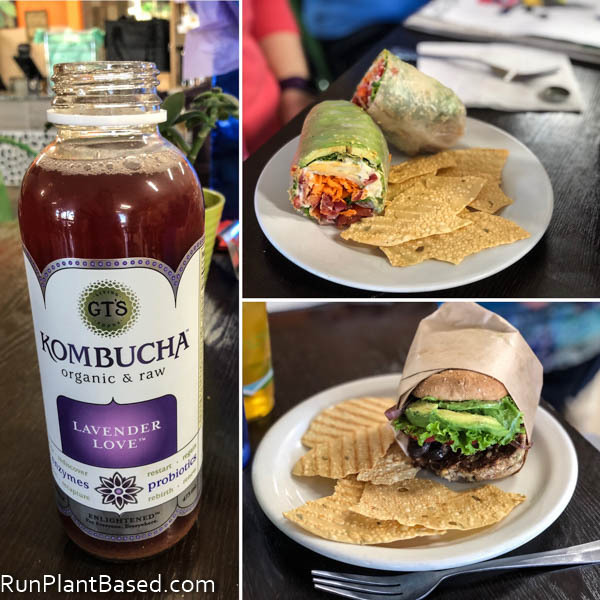 Saturday I met family and friends at Zest Kitchen to celebrate my Mom’s birthday where we got kombuchas, veggie wraps, and a mushroom burger. I got the fully loaded butternut squash panini with sage pesto. For dessert we shared the cinnamon swirl pumpkin “cheese” cake and chocolate coconut maple brownie. All amazing for a lighter, healthier lunch. I love eating at Zest because options are more centered around a whole foods plant based diet skipping oil and sugar. There are many raw vegan, oil-free, and gluten-free options. Tonight we ventured to Lou’s Sushi which is the only place we’ve wanted to go for vegan sushi in the Sacramento area because of the huge selection of creative options. 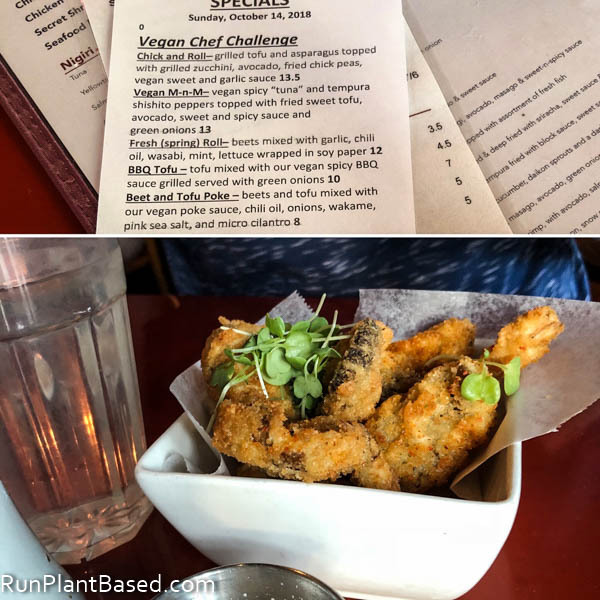 And they added more options for the vegan chef challenge, but we had to start with the vegan mushroom tenders again because they’re just addicting. Then on to the Beet and Tofu Poke which was delicious with seaweed salad, onions, and a sauce that took it over the top delicious. Luxury vegan boots if you have lots of money to spend. This vegan ultrarunner conquered addiction. Totally agree, love Miyoko Schinner. Is running every day safe? How to divest from companies killing the environment. Basic climate change questions answered. Wow Christine, anyone who thinks vegan food is boring is just plain wrong! The colors, textures and mouth-watering flavors of every picture here look amazing! Haha, so true and thanks! Never understood why people think it’s boring, there are so many more fruit and veggie options out there. Lou’s sushi is on my bucket list! It sounds like everything I love under one roof. 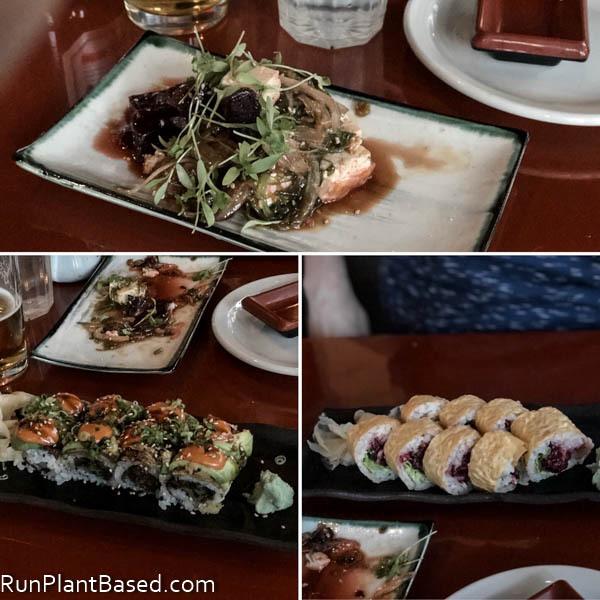 Such creative vegan sushi options… Ah, one day, I’ll get there…! So many awesome vegan choices! You’re so lucky to live in a place that has that many vegan chefs. Thanks and agreed! 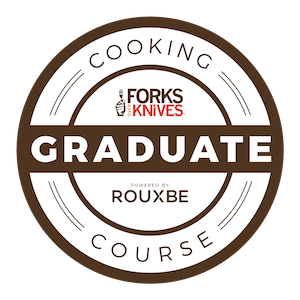 But you can start a vegan chef challenge in your area too – there are vegan organizations that will sponsor it and help you organize it. 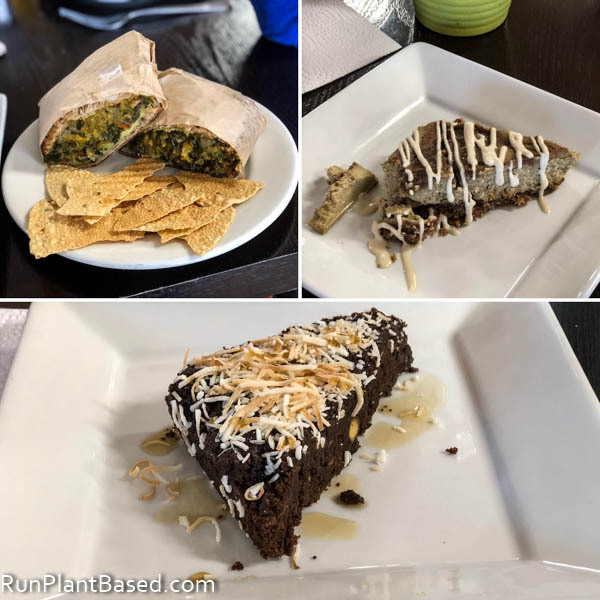 I love that so many of the restaurants keep vegan options after the challenge.